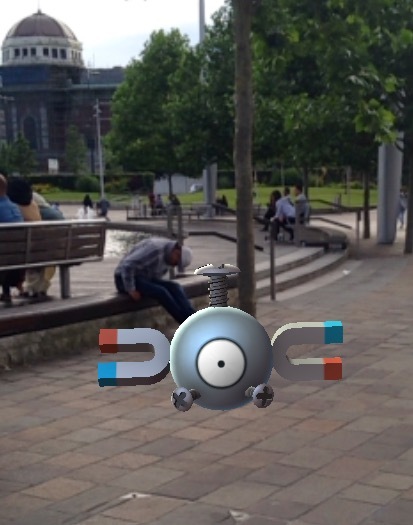 Its getting people out; groups of people, lone trainers, families – today I passed a mother and son in town catching Pokemon together. This takes gaming to a new, connective level. Most parents who buy their kids a gaming device don’t also buy themselves one, its expensive and a non-necessity, so to play it together involves turn taking. But Pokemon Go on individual phones at shared locations is real time interactive gaming, in a shared space with a softer one-upmanship that doesn’t rely on defeating your opponent. This is why my kid is getting her present early, so we can spend summer catching Pokemon. The whimsical nothing-better-to-do nature walks through Judy Woods that as a teenager she can no longer be bothered to come on, she will come on to catch Pokemon – it adds purpose, it bridges the gap of adolescence-to-adulthood shared experience, increases shared time together and gives us something to talk about. Its free, and it also connects us with our community. I’m learning so much more about my community – The Mermaid in the Well? Yep, that’s a thing in Bradford. I’ve lived here All My Life and I had no idea that was a thing until last Friday. And its not just me that benefits from learning more about what my City has to offer; community services under threat of decline like museums, libraries and community centres marked as PokeStops are tipped to benefit from a rise in footfall – already local businesses are cottoning on requesting to be PokeGyms since a Costa in Worcester reported a 30% rise in footfall after their café became marked as a PokeGym. And you learn even more about your neighbourhood and what it has to offer while searching these places out, plus it makes the random asleep people look more fun, all this while getting a free cardio workout! I walk more – I go out of my way and zigzag routes to bypass PokeStops, I got off the bus 7 stops early on my way home. SEVEN! Pokemon Go has taken the gaming platform back into the real world and instead of sitting down not moving playing games, its got people moving, and moving outside. Example: so I’ve got these eggs from a PokeStop right? And to hatch them I have to stick them in an incubator – each egg is assigned a distance 2km, 5km, 1o.km, they only hatch when I’ve walked the assigned amount and no, somehow it can guess when I’m on a bus so I cant cheat the system. Today I hatched a Pidgey and a Magikarp. If I want to build up my Pokemon for battle, I have to walk round and catch more for stardust. If I want to stock up on Pokeballs, I have to walk to a PokeStop, then walk to another, and another… If I want to battle, I have to walk to a PokeGym, and I have to be in close proximity – if none of these things are inside my avatars catchment field, it tells me its ‘too far away’. I have to get up and move, no cheats. And I cant just ‘catch them all’, I have to keep catching so I can exchange surplus Pokemon for sweets to feed to my favourites. This takes the issue of virtual gaming and childhood obesity and deals with it in an accessible way; you don’t need to live in town, you don’t need to live in the country, you don’t need to live in a nice area – it doesn’t matter if your environment is urban, suburban or rural, you’re encouraged to explore, interact and connect with your immediate surroundings and then go that bit further – through a reward system that that works even though it isn’t based on chocolate!